Today I had my sixty-fifth birthday. I've had a good birthday with phone calls, text messages, cards and gifts from family and friends today, and an afternoon tea with knitting friends and knitting yesterday. If you thought you recognised the shawl de jour - the Aestlight - you're correct. Beautifully soft in a subtle oyster grey yarn dyed by Knitabulous. 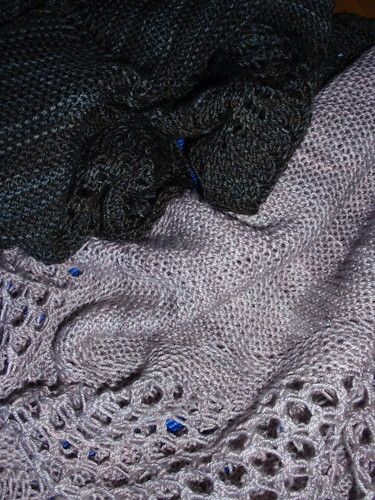 The other rich graphite coloured small shawl is a mystery for now - a new design of which I am now wearing the prototype! I wore it to work today and loved it. 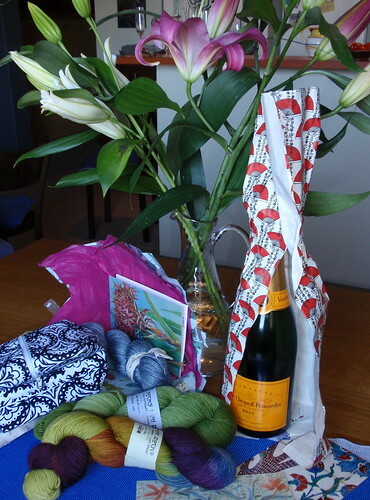 My knitting friends know my tastes well - and they are generous. I hate coyness about age. Aging is natural - something we all come to experience, if we're fortunate. Even so I found it hard to write that I'm sixty-five. This is definitely 'old' territory. Getting older is strange. It's not like there's a specific point at which you stop being 'younger' and become 'older'. You gradually become the person you are, and I imagine (and hope) the process of growing and developing continues indefinitely. But others often treat you differently as you age, and it's hard not to be affected by that. I've been fortunate so far - enjoying family and friends, having good health, and being able to afford to do many of the things I wish to do - at least the more sensible ones! So, today, I'm wishing myself continuing good fortune beyond sixty-five. A couple of years ago, when I would have thought it impossible that I would ever have a blog, my daughter recommended that I read Sweet Juniper. It was love at first read. Sweet Juniper started as a parenting blog written by a father, but over time has become a more general reflection of Dutch's passions ('Dutch' is the blogger's nom de keyboard). He lives with his family in Detroit, Michigan in the USA. He has chosen to live in this city - more generally a site of avoidance. The part of his blog I really like, apart from his photographs which are beyond wonderful, is his commentary on living in a once-grand industrial city that has become a reject of the post-industrial world. During my presentation, I showed them the photo of the tree growing from the books to explain how social bookmarking sites like digg and reddit can help reach beyond a particular audience or region to attract potential readers from all over the world. During the questions afterward, a member of a group of Detroit community activists stood up and angrily accused me of distorting the image of the city to the world, portraying only its ugliness, and she told me I should be ashamed. She had never read this website; she had only seen a few photos during the presentation. After the room cleared, I tried to initiate a dialogue with these activists. The argument they posed was that there are many people working very hard to do positive things in Detroit and they have been doing so for many years before I arrived (I was called a carpetbagger, and replied that Detroit needs more carpetbaggers: about a million of them). To those working hard for positive change, any media attention perceived as negative (be it about crime or failing city schools or neighborhoods turning to prairie), is somehow a rebuke of their good deeds. These people attacking me were good people. But they were, in a sense, no different from the right-wing ideologues shouting endlessly during the worst days of the Iraq War that "the media never reports the good news in Iraq." I suppose I sympathize with any journalist unable to see past the dismembered corpses of suicide bombers and their victims to write only positive news. I told these angry activists that I am not a reporter. I am just one man telling his story. If you don't like the story I'm telling, start your own blog and tell yours. That's how this works. This post echoes, much more eloquently than I could manage, several conversations and discussions I've had recently - at work, with my friends, and within knitting circles. The way we spread information about our lives and our world is changing. We can't control the spread of information - even if we wanted to do so. We also can't control how people read and interpret the information we make available. What we can do is contribute a point of view and make sure that it is as interesting and engaging as possible. As Dutch says - that's how it works. 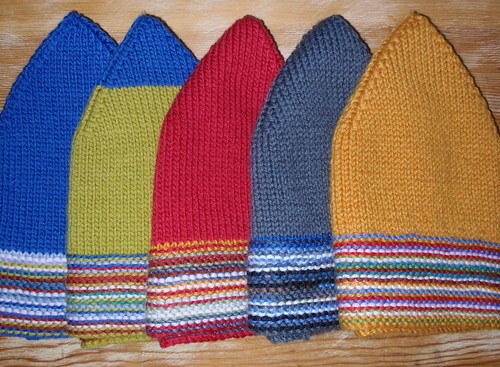 I've knitted some hats for the WinterWarm project that sends woollen clothes to children in Afghanistan. 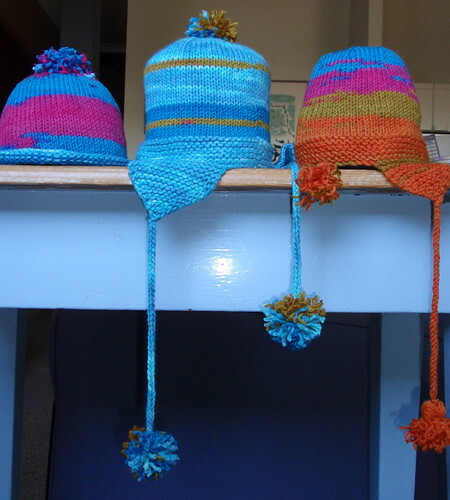 The pattern is 'Kim's Hats' by Kim Hamlin from Joelle Hoverson's 'Last Minute Knitted Gifts'. I've found this book a most useful source of ideas and patterns for quick, simple, but stylish projects - though not nearly as quick as the hypothesised times for the projects! I've knitted these in some yarn that's aptly named Mondial Bizarre that I bought in a sale (only the colour and colour sequences are bizarre, the quality of the yarn is lovely) and some remnants of Happy Spider 12 ply. I hadn't made pom-poms since I was in school decades and decades ago and their quality leaves much to be desired. I also made some garter stitch border hats following Mustaa Villaa's recipe that I've blogged about before. I ended up with 5 of these which I really enjoyed making. I find repetition strangely pleasurable. Yesterday I took them with me to the Stitches and Craft Show to join the other knitted garments being so admirably collected by Sally. She has an account of just how much was contributed this year. I always feel a bit uncomfortable about charity knitting - I sometimes think the recipients might prefer a polar fleece hat with a 'name' label. But in this case I do know that warm clothes are needed for the bitter winter in Afghanistan, I do know that WinterWarm will ensure the garments go where they are needed, and I've set myself a rule that I will only knit things I'd be happy to wear myself or give as gifts to friends and family. I sometimes overthink such matters! Some knitting projects are meant to be. Things come together. 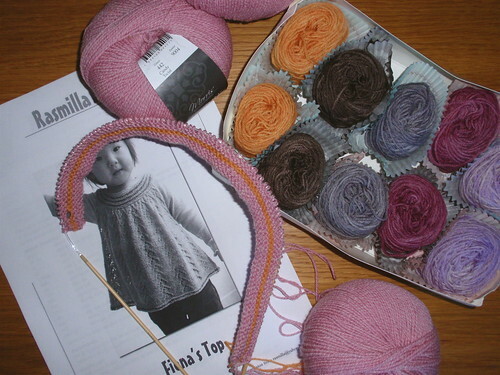 I've just started knitting Fiona's Top by Rasmilla, which (of course) is destined for the dotee. This has been in my Ravelry queue for some time. In addition to its being a really cute pattern that's also extremely useful, I felt a distant but personal connection to it. Fiona, the little girl whose image is on the cover of the pattern, and after whom the pattern is named, is the daughter of my Danish 2008 backtack swap partner, Anne. It adds richness to a pattern when you have some connection, however distant, with the designer. I'd bought some Morris and Sons Empire 4 ply merino for this project in a very old-fashioned pink. Mentally, I've labelled it 'cochineal icing' because it's the pink of the iced cup-cakes of my childhood. But I'd hesitated to start knitting because I couldn't decide what colour to make the stripes on the yoke. 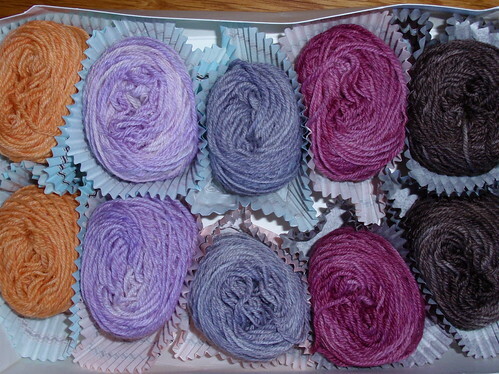 Then, I bought a tray of Knitabulous's yarn cupcakes (she calls them sock blanket kits) simply because they were irresistible. And I realised the colours were perfect for the yoke stripes. Finally the project came together. 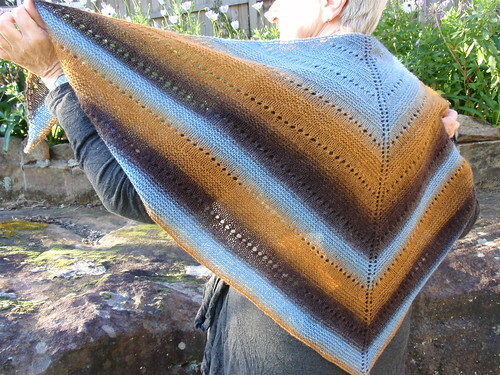 It's La La's Simple Shawl (a free pattern is available for those with access to Ravelry). It's a very regular combination of stocking stitch, garter stitch and yarn overs that I've knitted with Kauni yarn - an Estonian yarn that I imagine was originally designed with colourwork in mind - it has that prickly catchy quality of many traditional yarns. The Effektgarn version of the yarn has long colour sequences in unusual combinations. 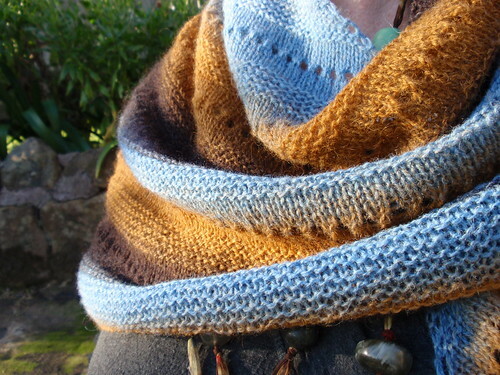 The blue and brown combination in this yarn reminds me of a favourite dress I wore in the 1960s. Yesterday I had a discussion with knitting friends about the advantages and disadvantages of various kinds of yarns for shawls. (I attended the infamous 'knitting playdate' with FredAstep, 1funkyknitwit, KnitNess and RoseRed - but that's another story). I'm quite happy to tolerate the prickliness of shetland style yarns because (a) I love the visual texture of them,(b) they block perfectly and hold their shape and (c) they stay on my shoulders without falling off and without having to be adjusted all the time. This last factor is the clinching advantage for me. But I do understand that others may prefer softness and drape in their shawls, and that some patterns would be most inappropriate in the prickly yarns I love. Thanks to Margarita for the photos - so nice to have pics of the backs of things! 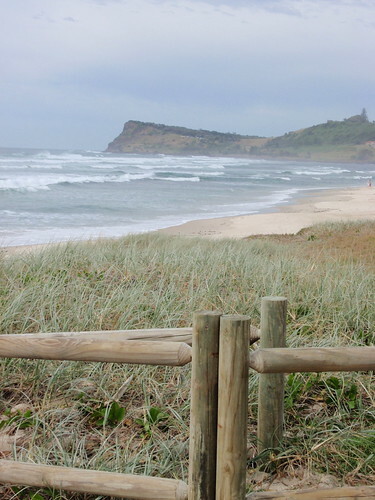 This is the beach at Lennox Head, looking towards the headland after which the town is named. Last week I stayed with a friend who lives about a 5 minute walk from this beach. Living in the midst of the city as I do, my visits to Lennox Head jolt me to an awareness of the vulnerability of so much of our landscape. In May there was a very large storm that washed away large portions of the beach. There is concern to restore the vegetation that protects the beach from further damage and a need to restore pathways and access to the beach. The paths have been relaid with visually appealing tiles made from recycled materials. It's in places such as this that you are acutely aware of how much damage can be done by slight rises in the sea level - not only to the beach and heath and lake but to the built environment as well. We've built right to the edge of viable land (and sometimes beyond). It's very easy to imagine that the effects of global warming will be disastrous for such places. 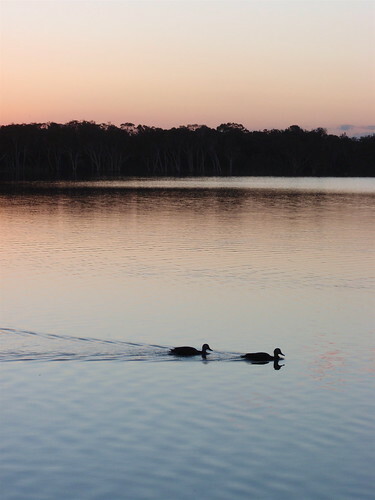 Just across the road from the beach is Lake Ainsworth - a freshwater lake edged with ti-trees that give the edges of the lake a silky maroon colour. The lake seems to be constantly endangered. Years and years of fertilisers and stormwater drainage have made it vulnerable to blue-green algae, and its proximity to the ocean means that inundation by rising levels of seawater is a constant concern. I didn't mean for this to be such a tale of gloom. When you're there you're just overwhelmed by its beauty. But I did come away with renewed admiration for those local people (including my friend) who fight various local battles to preserve aspects of the environment, and renewed awareness that all of us need to act to moderate the climate change that endangers such beautiful places. I think I have an image of my brain as something that needs, periodically, to be shaken up, jolted about, and topped up with new experiences or ideas. Otherwise, it becomes altogether too boring, staid, and set in its ways of thinking. Fortunately, I've just had a week or so that's presented a number of such 'shaken all about' opportunities. So, the Festival. 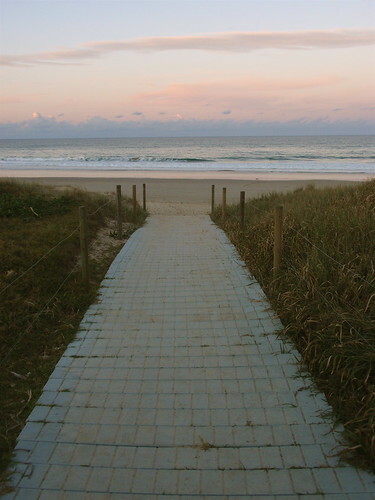 For the information of readers outside Australia, and maybe for some within, Byron Bay is a coastal town on the far north coast of New South Wales, about 800ks north of Sydney and almost at the Queensland border. The beaches are breathtakingly beautiful, and the hinterland is charming hills and valleys covered in sub-tropical vegetation. This area was the preferred destination for hippies dropping out in the 70s and is still characterised by much debate and discussion about environmental issues, alternative therapies, individual choice and responsibility, residents' action, and the evils of development. It's now also characterised by very high house prices, sophisticated cuisine, and the latest in casual chic. In other words, it's quite a sensible place to hold a writers' festival. This is the third time I've been to the festival, and each time I have thoroughly enjoyed it. It lasts for three days, and so from 9 to 5 over three days I sat and listened to people talking about books and ideas. 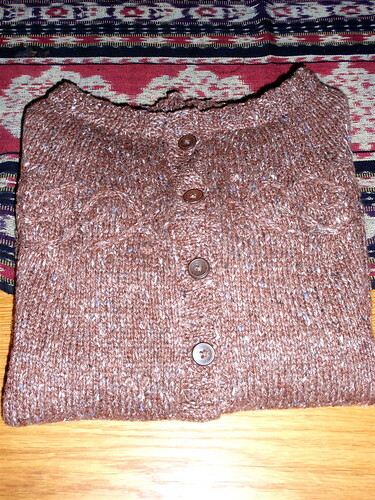 (Of course, I knitted too, but I didn't achieve nearly as much as I had hoped). 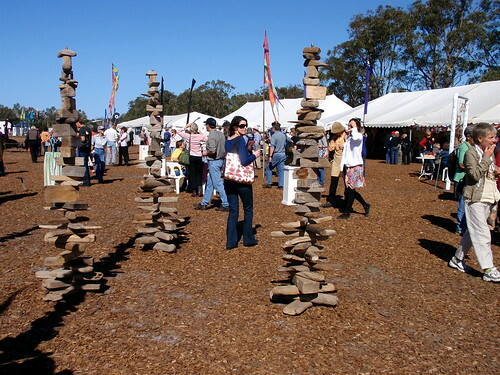 Thousands of people attend the festival which is held in several enormous marquees pitched in the rather barren Belongil Field - though the organisers had tried to add interest with the work of local sculptors displayed in the central area. There are at least four concurrent sessions at any one time, so there's lots of choice and the inevitable disappointment of missing the events that others declare to be the high points. There's great diversity in the topics - just making a random selection from Friday's program there were sessions on the need for an Australian Bill of Rights; grief; the ethics of writing about war; women at mid-life; China in literature; what writers read; the role of the public broadcaster, and many others. 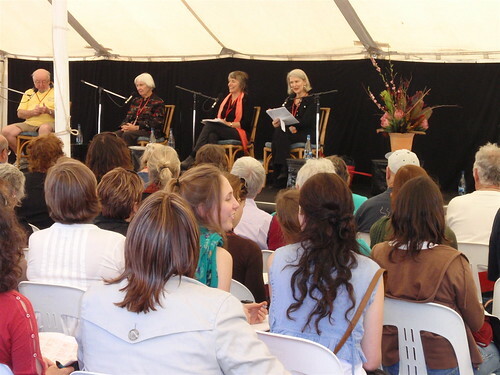 The 'big names' at the festival were human rights lawyer Geoffrey Robertson and the philosopher of ethics Peter Singer. Both well worth while listening to (though not without the occasional mental 'yes, but...'). My favourites? Probably a couple of presentations by Robert Dessaix - one on 'An Examined Life' and the other on 'Writing Home'. They were masterly. Beautifully written, wry, self-deprecating, erudite and perfectly read. As a member of his audience I felt really valued by his having taken such care with his work. As always with such events there were unexpected pleasures - a panel session on 'place' in poetry that was wonderful. In fact, having been a 'prose' person all my life it has inspired me to revisit poetry. And I must confess the guilty pleasure of enjoying Tom Keneally and George Masters jousting with one another about Rugby League. You can see how diverse the program was. Lots of jolting of my brain. 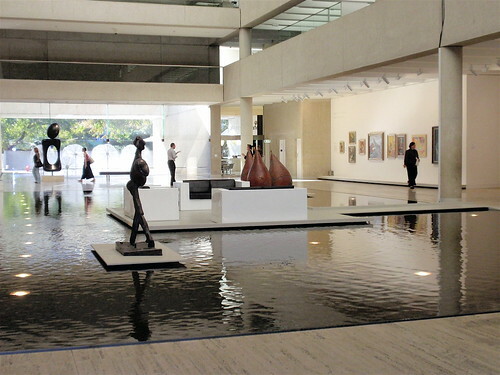 On a brief trip to Brisbane I managed to squeeze in a visit to the Queensland Art Gallery - such a pleasure with its riverside location, lovely spaces, manageable size and general child-friendliness. We went specifically to see the current exhibition 'American Impressionism and Realism', most of which is on loan from the New York Metropolitan Museum. It's the kind of exhibition I really like, where paintings or other works of art that you are not really familiar with are contextualised so you can see how they fit in with other bits of the story you do know. In this case, it's American (or, more accurately, USA) painters who were influenced by the French Impressionist and Realist art movements of the late nineteenth and early twentieth century. I was familiar with the work of only a couple of the painters represented - principally the portraits done by John Singer Sargent and Mary Cassatt. What I found very interesting was the extent of what might be called the globalisation of artistic movements and ideas at this period. This notion of global influence was extended by including in the exhibition some works by Australian painters of the same period - Tom Roberts, Charles Conder, Rupert Bunny among others - so that you could appreciate the extraordinary influence on world (or at least western) painting of these French art movements. And my final cultural infusion was hearing and seeing Puccini's 'Manon Lescaut' at the Opera House last night. I'm a sucker for Puccini. I love having his great waves of sound and emotion roll over me. I'm not familiar with this particular opera, which was written quite early in his career and was his 'break-through' work. You know the story, even if you don't. The central character, Manon, is torn between love and riches. Initially she chooses love, deserts it for riches, is seduced again by love and then sentenced to exile (in the USA!) for her choice. She perishes in her lover's arms in the deserts of Louisiana (Puccini's geography leaves much to be desired). Cheryl Barker was brilliant as Manon - able to convince you that she was simultaneously ditzy and passionate. Despite its geographical and physical impossibility, the final scene, in which she suffers and dies, is completely emotionally convincing because of the power of Cheryl Barker's performance. Interestingly, this opera is of the same period as the paintings I saw in the Queensland Art Gallery, and Puccini as an artist shares some things in common with the 'Realists' of the exhibition - most notably the intention of presenting life in its grubby as well as more elevated aspects. So, my brain, and my eyes, and my ears have been shaken and jolted so that (I hope) they are better able to see, hear and think about things in new ways. I need this every so often. The Tangled Yoke Cardigan fits my daughter perfectly and she likes it. What success! Even more success - we went out for lunch with my daughter wearing her new cardigan and a scarf I had knitted her; my son-in-law wearing a scarf I had knitted him and the dotee wearing her recently knitted frilled cardi. They are either very kind to me or they like their hand-knits or, preferably, both. It's done. 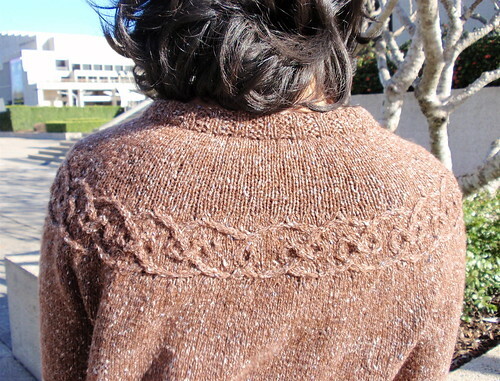 The Tangled Yoke Cardigan. I finished it in exactly a calendar month - 4 July to 4 August. 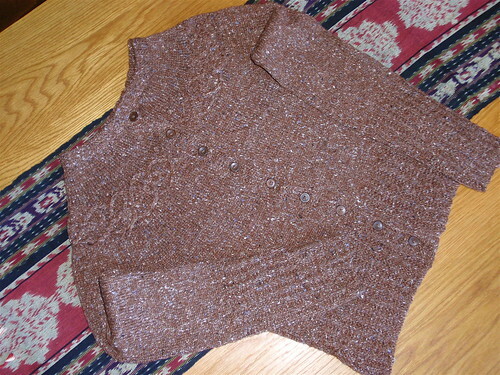 Even though I didn't complete this cardi, which was my Tour de France project, within the scope of the Tour, there is no way I could have achieved a whole garment - in 5 ply, no less - within a month without the impetus of the TdeF knit-a-long. Now my worry is about whether the cardigan will fit. I'm hoping to catch up with my daughter next week, so this will be the next test. There'll be photos if it fits, and tears if it doesn't. I'll reserve judgment about my version of the Tangled Yoke Cardigan until I see it on my daughter. After blocking, the fabric is unexpectedly drapey - well, unexpected by me, anyway - and I think it needs a person inside it to show the cut and fit. This is also the first time I've knitted an adult garment that is not knitted in a series of flat pieces sewn together, and I'm still not sure what I think about this. I'm not particularly averse to sewing up completed garments, and I think the seams give stability to the garment construction. There's a kind of flimsiness to this cardigan that I'm in two minds about. Anyway, further judgment reserved till I see it on my daughter. The colours of this Kauni yarn are superb, and together with its prickly Shetland type texture it might just about get my vote for the perfect yarn. In a previous post I'd described the yarn as Danish, but I've since discovered it's Estonian. Apologies to Estonia for not correctly attributing such a beautiful product. 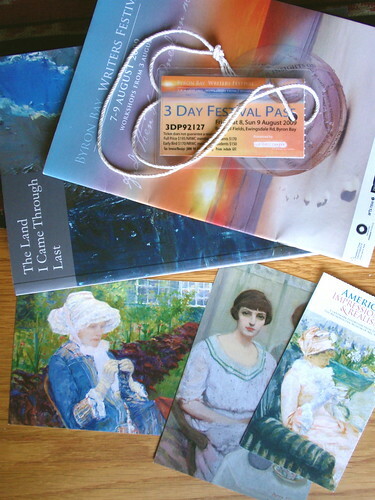 Today I'm off on a week's holiday, to visit old friends and attend the Byron Bay Writers' Festival. So, no computer and no blogging till I return. This time I've had no difficulty deciding what knitting to take - I'm just hoping I come somewhere near to meeting my knitting expectations. There'll be lots to report on when I get home. I love days when I can just potter around...days when I have no commitments and I can idly move from one activity to the other. Of course, there were many things I could and probably should have been doing, such as supermarketing, cleaning, or preparing my tax return, but I've chosen to do none of these. Over the last few days I've had an urge to make another small shawl (I'm absolutely refusing to use the ugly word 'shawlette'). I wear my small Ishbel frequently. It's a wonderful buffer against the rather severe air-conditioning of my office and just enough decoration for plain clothes. So I've been looking at patterns on Ravelry and weighing my options. Initially I thought I wanted to make something silky and light, but (predictably) I found I was attracted to simpler, slightly heavier shawls. 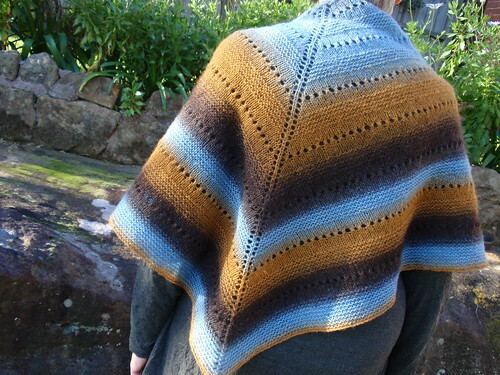 Eventually I decided on LaLa's Simple Shawl, significantly influenced by Mustaa Villaa's recent adaptation. I went searching through my store of yarn, and the choice was again predictable. I rediscovered a skein of Kauni - a Danish yarn with the same slightly prickly texture of Shetland yarns. I love the fabric these yarns produce and I find the slight prickliness is offset by the way scarves made from these yarns fall and cling to your clothes when you wear them. 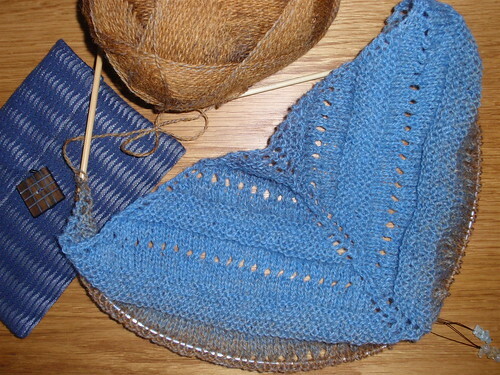 So, I pottered around to assemble pattern, yarn and needles and cast on to begin knitting the small shawl. 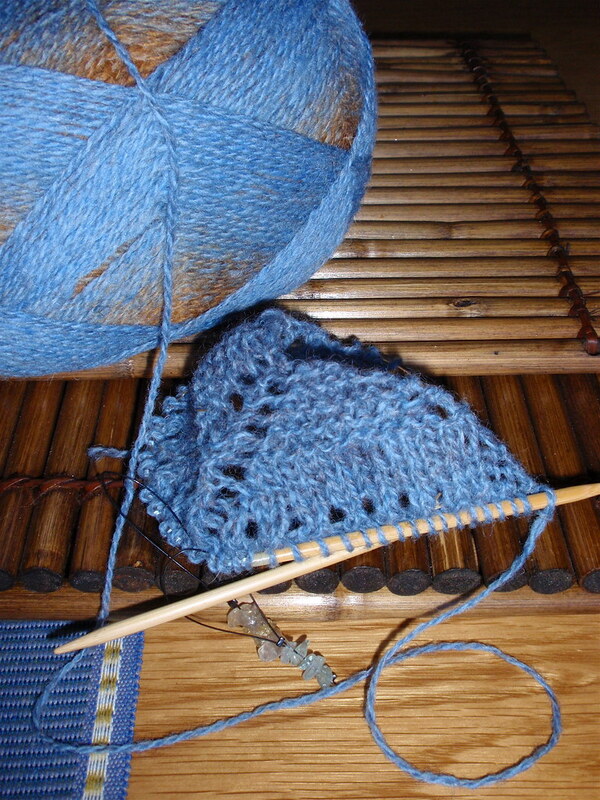 The yarn's in a wonderfully retro combination of blue and brown. By mid-morning I pottered off to have coffee with some of my neighbours at the local French patisserie. There is a standing arrangement that anyone who is around about mid-morning on Saturday can meet at Gwen's for coffee and pastries. A great way to catch up with neighbours and the local gossip. 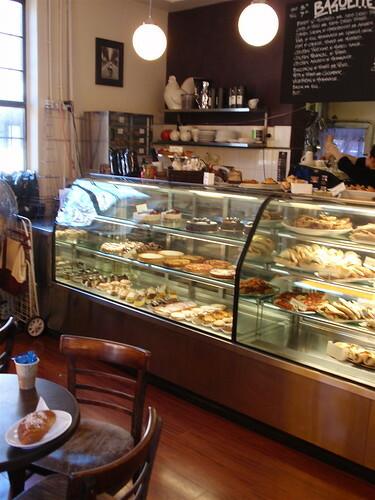 'Gwen's' is more formally the St Germain Patisserie (corner of Rosehill and Boundary Streets in Redfern if you're interested) and has a great range of traditional French cakes and pastries, cooked on the premises. Later, I pottered off to All Buttons Great and Small at Newtown for buttons for the Tangled Yoke Cardigan that I hope to finish this weekend. 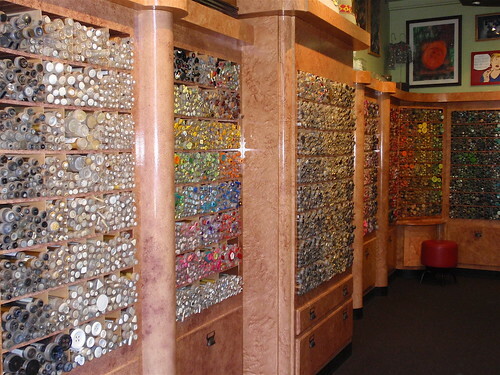 This beautiful shop has such an extensive range of buttons - you can potter around within the shop and continuously discover new and beguiling buttons. 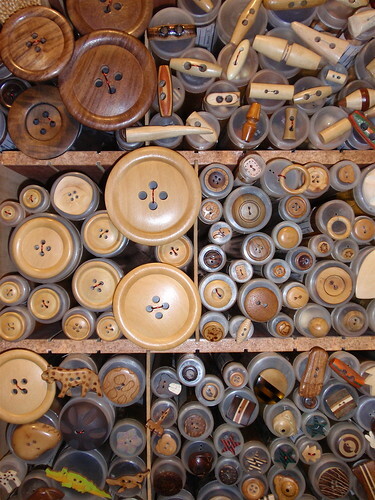 Eventually I bought some metal buttons whose finish echoes variations on rust - perfect for the brown tweedy fabric of the cardi. 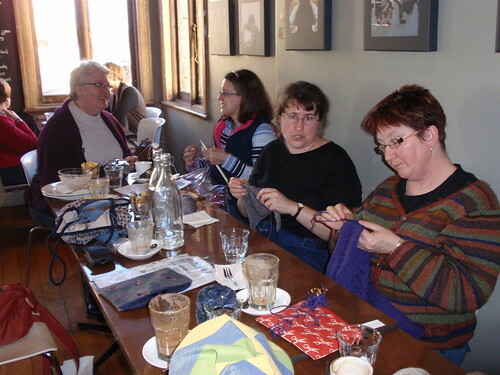 And then I pottered to SSK at Barmuda in Newtown for more coffee, more knitting on my shawl, and more idle conversation - this time with fellow knitters. I always love the light in the upstairs room at the cafe in which SSK meets. It has a mellow quality that suits the pleasures of knitting. I'm now home - pottering with this blog post while waiting for my pot of osso bucco to cook slowly. A perfect day. PS In re-reading this I've realised it sounds like advertisements for my favourite shops. On reflection, I don't mind if it does. These places give me a great deal of pleasure.